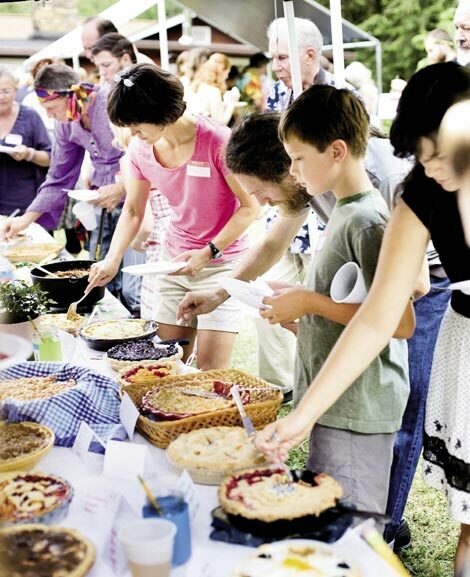 Pie Party: Each August, a group of friends parade up the gravel drive to Barbara Swell and Wayne Erbsen's home in Asheville bearing pies of all flavors, savory and sweet, with wacky names like Lazy Wife, Hungry Hobo, and Doggone Good Apple. A delicious frenzy of tasting and judging ensues and by sundown, nary a slice remains. Follow Barbara's lead for summer fun with recipes and tips for hosting a yummy gathering. Marti Otto, dressed as Mexican painter Frida Kahlo, takes first place in the costume contest. players circle around Wayne for an old-time jam. Aprons are among the prizes awarded. The couple’s daughter, Annie Erbsen, and her husband, Gianluca De Bacco, show off their winning pies. The crowd gathers to hear the contest rules. Plan the contest at least a month in advance. Before the event, offer a crust workshop, because that’s the most important part of an expertly crafted pie. Choose categories, so many people can be recognized for their efforts. The contest has first-pie-made, youth, fruit, chocolate, veggie, meat, heirloom, tart, cream, gluten-free, and nut divisions. Pick a theme and offer prizes. Our contest is retro and bakers come dressed accordingly. The prizes—most donated by participants—include vintage aprons and bakeware, rolling pins, dishes, and cookbooks. We offer prizes for bakers as well as best costume, person who looks most like their pie, and best rolled crust. Register the pies on the day of the party. Include the baker’s name, pie name, and category. Each baker is given a number that corresponds with the name card displayed with the pie, so the bakers remain anonymous. Group the pies on tables by category. Each pie has a knife and spoon so people can serve themselves a small taste. Pies are not cut until the hostess gives the signal. Make everyone a judge. If your contest is large, have each participant choose a category to judge. Be sure to provide pencils and paper for voting, after which people may taste as many pies as they like. Provide an activity for the guests while votes are being tallied. We have live Appalachian string band music. Keep things light and fun. From the start, we tell people our pie party isn’t fair. We have reserve prizes for people who don’t win a category, but are still proud of their creations.